Canberra is home to not one, but two Australian parliaments. For 61 years Australia had a provisional parliament, built to house 300 people. By the time the new, permanent, parliament was opened in 1998 there were 3,000 people working in the old building, which even with multiple extensions was short of space. The new Parliament is built into the hill above the old Parliament, perfectly aligned on the land axis running from Mount Ainslie to Red Hill. For a 4,700 room 80 acre complex it is surprisingly modest on the landscape, built into the hillside. It is also surprisingly open, or at least compared to the British Parliament in Westminster or Canadian Parliament in Ottawa, feeling much more like a true public space, than a carefully guarded fortress, only accessible on tours. The lobby is a forest of marble columns, leading into the Great Hall, home to the second largest tapestry in the world replicating a painting by famous Australian artist Arthur Boyd, found on the balcony. There is a terrace area at the front of the building, home to a stature of Queen Elizabeth II, and some lovely views of the land axis through to Mount Ainslie. The centre of the building is home to a sizeable atrium, above which is a monumentally large flag pole. Off from the atrium are the House of Representatives (green like Westminster) and Senate (red, also like Westminster). The old Parliament is now the Museum of Australian Democracy. 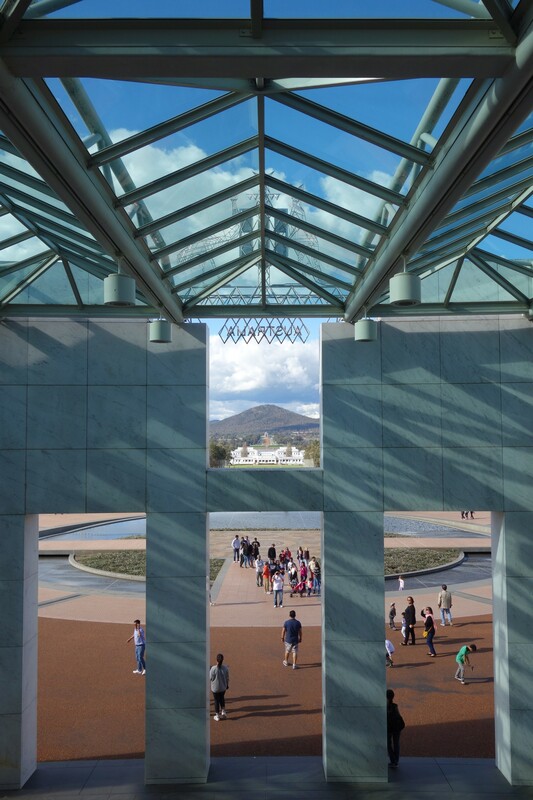 It is packed with interesting exhibitions covering every aspect of democracy in Australia. Rather than Queen Elizabeth II there is a statue of King George V in the lobby area. Off the lobby lie some familiar green and red rooms. The Prime Minister’s office was a reasonably smart corner office, laid out so that the PM had their back to (non-bullet proof) windows. In front of the old Parliament is the Aboriginal Tent Embassy, a semi-permanent assemblage claiming to represent the political rights of Aboriginal Australians.